Some games give an advantage to the start player. That player gets the best goods, stakes out the best position, wins far too often because of the advantage of opportunity. Some others give an advantage to the last player. That player gets the best view of the table, can make the perfect bid without fear of being outbid or of overpaying, again winning far too often because of her position in the turn order. Many game designs carry in them player order advantages such as these. Fortunately, we have tools to detect them and tools to redress them. Part 1 of this series looked at detection and two potential solutions to a player order advantage; starting bonuses and changing start player. This led to a flurry of fantastic comments which will be discussed in part 3 of this series. Today’s, column focuses on changing player order, tie breaking and differing goals. Last column looked at changing start player from one round to the next as a method of addressing player order advantages. Some games completely reassess player order each round. This approach has the advantage of being completely responsive to each player’s position but does run the risk of being fiddly. The best uses of this are either transparent and quick or integral to the rest of game play. Many modern racing games take the transparent and quick approach. Each car on the race track acts in race position order from front to rear. Once every car has moved, a new round immediately begins, this time in their new position order. 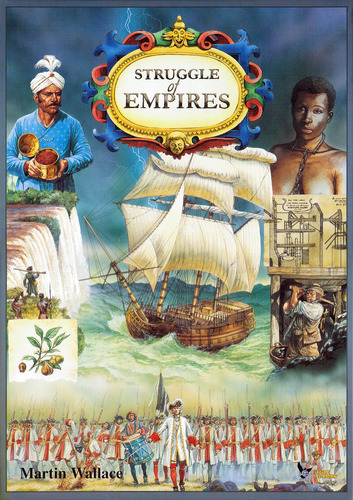 Struggle of Empires took the approach the approach of being integral to play. Establishing turn order in Struggle of Empires is sometimes the longest part of a given game round but it is essential to the rest of play. Turn order is set by auction in which players not only assign order but also alliances. Since allied players cannot attack one another, a player in a poor position can adjust turn order and earn a cease fire by positioning himself into an alliance with a pugilistic rival both at the same time. Sometimes, the solution to player order advantage can be found in tie breaking. This is particularly handy in area-control games and racing games. An end player advantage is mitigated by breaking all ties in favor of the start player. A start player advantage is mitigated by breaking all ties in favor of the end player. Terry Goodchild’s Formel Fun is a racing game that employs this approach dynamically. If two cars are equally far ahead, the one in the inner lane goes before the one in the outer. To make this completely clear, the game rules direct players to always place their cards into the innermost available space when they move. A great way to eliminate turn order issues is to give different objectives to each position. Each player’s culture sets turn order and differing objectives in the Avalon Hill classic Civilization. In particular, Africa is first in turn order but has the most difficult road on the Archaeological Succession Table (AST) shown above. Egypt is last but has the easiest road on the AST. Civilization also gave each position at the table a different starting position on the map and through those positions, different options. Fantasy Flight’s game Sid Meier’s Civilization: The Board Game gave each player different options in much the same way that the computer game does–through special powers. The Romans advance on the culture track each time they build a wonder, build a city, conquer a village, or conquer a city. The Americans by contrast convert trade into production at an accelerated rate. Each of these abilities will push their player toward different foci and thereby tend to mitigate the importance of turn order. Chaos in the Old World achieved differing goals through a variety of methods. 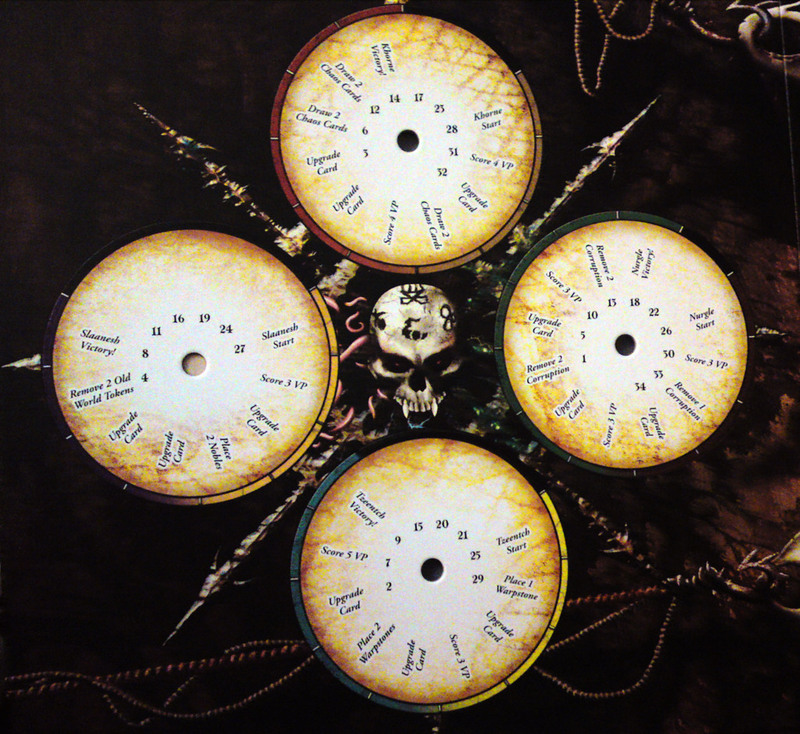 Most prominently, each faction gets a unique progress dial. Since each dial awards different bonuses as it progresses, player strategies must differ appropriately. Changing player order, tie breaking, and differing goals are three of my favorite techniques for mitigating a player order advantage in my designs. Put these, long with starting bonuses and changing start player, into your game design toolbox. They will empower you to address any player order advantages that appear in your designs. Next column we examine the suggestions and examples you wonderful readers have contributed to this series. Let us know how you track player order advantages and what techniques you use to mitigate them. Please post them so we may share them with your fellow gamers. And if you’re enjoying what you’re reading, create an account with WordPress and follow this blog. You keep reading. I’ll keep writing. I am in Niagara Falls for a convention this week. Roomie Walter Hunt and I have taken to enjoying this weather with a morning walk every day. The air is crisp. The sky is clear. The breeze is cool. The conversation is engaging and interesting. We make no effort to discuss games or gaming–and usually don’t since Walter is a history buff and enjoys sharing his knowledge–but today we did. We probed this opinion in great depth while the miles rolled by under our feet. Walter’s view is that to form meaningful opinions about the latest game, fans should understand its ancestry. This strongly echoes the position Austin Kleon took in one section of his book Steal Like an Artist (book report coming soon! ); that we should all strive to learn from our artistic ancestors. For me, this raises an essential question: What ARE the essential games? What are the landmarks everyone should play in order to put modern design into context? And since you’re reading this blog, you get to read my answers. With absolutely no further ado, here is the first in my series on landmark games. 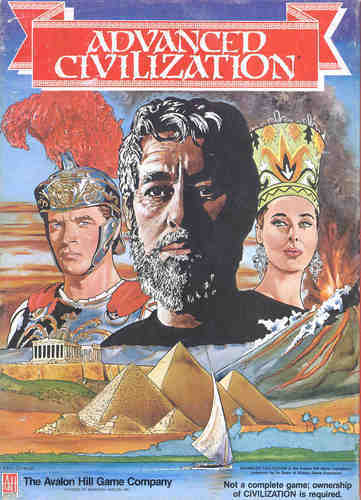 Civilization was originally released in 1980, designed by Frances Tresham and Mick Uhl. The expansion Advanced Civilization released in 1991. Civilization is a solid game on its own but I suggest you find the time to try the expanded version offered by Advanced Civilization. It is a solid example of the right way to create a game expansion. There are a number of things a twenty-first century gamer such as yourself will learn from playing this 34 year-old game. The game rules are quite deep. Avalon Hill rulesets are written in legalese. They are not an exciting read. Look past that at the core of the rules. Reduced to the essentials, they are not terribly long but offer remarkable depth. Trading brings players into direct contact regularly. Examining your resources, trying to find a player who has what you need, convincing that player she wants what you to offer, all keep the interaction in the game high. This is particularly important when you understand that the game generally takes about eight hours to play. Calamities force players to constantly struggle with the game in addition to the other players . Advanced Civilization is a game that requires players be proactive and reactive. Some calamities will strike. The player who can best prepare for and respond to these calamities is the player who has mastered Advanced Civilization. How has Civilization influenced modern design? 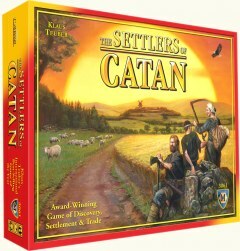 International sensation The Settlers of Catan is a perfect example. Notice how the trading phase and the robber can both be seen as direct descendants of Civilization. What are the landmark games? Which titles should every game enthusiast play at least once? Advanced Civilization is my first suggestion. Return Tuesday to see what you think of my second. Have you played Advanced Civilization? How do you feel about holding it up as a landmark game? What other games do you see as notable ancestors to newer games? Which ones were the (ha-ha) game changers? Share with your fellow readers in the comments below. And if you’re enjoying what you’re reading, create and account with WordPress and follow this blog. If you keep reading, I’ll keep writing.